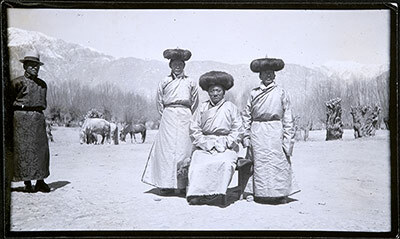 Three members of the Tibetan Aristocracy in official robes at the Review at Trapshi. They are from left to right Jigme Taring, Tsarong (seated) and Rai Bahadur Norbhu Dhondup. They are all of fourth rank or above wearing a light coloured silk robe lined with fur and a round, fur, flattish hat. On the extreme left there is a man wearing a dark silk robe and a Homburg hat. In the background, there are ponies, willow trees and mountains. The Tibet Album. "Jigme Taring, Tsarong and Norbu Dhondup at Trapshi" 05 Dec. 2006. The Pitt Rivers Museum. <http://tibet.prm.ox.ac.uk/photo_1999.23.1.10.1.html>.